If you're thinking about a Destination Wedding while you're on a cruise, look no further than Grand Cayman. 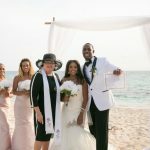 Grand Cayman is a popular stop for all the major cruise lines and it's the easiest place in the Western Caribbean to tie the knot, with experienced wedding vendors and quality services. In finding my blog, you are already halfway there. 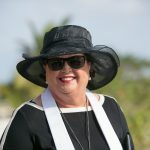 The bride below told me she spent a lot of time on my blog seeing what other brides had chosen, and she was happy with my all-inclusive cruise wedding, plus some additional services. For example, she chose to add a 6" wedding cake with a dendrobium orchid topping since she was having a group of six. Even if you want the simplest of weddings, my top recommendation is to get professional photography. Unless you plan to bring your own photographer, its best to get one of the photography packages we offer. If you want a big name photographer, we can organise that as well, just remember that there is an additional cost. 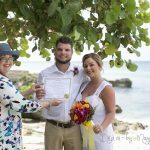 All our wedding packages include all legal requirements, including the Special Marriage License (a $200 value) and the Registered Marriage Certificate. 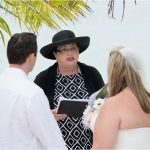 Choose our standard ceremony or personalise your own readings and vows.